Leo Hirschfield invents the Tootsie Roll and names it for his daughter. His new hand-rolled candy sells for one penny. Tootsie Rolls are now made in a four story New York City Candy Factory! Tootsie Rolls...Delivered by horse & buggy! Tootsie Roll Industries has supported America's troops throughout history and continues to do so today. Tootsie Roll Advertisement. March 27th, 1920. The Tootsie Roll Tootsie Pop is invented. We still don't know how many licks it takes to reach the center but we will continue to try. Tootsie Rolls Truck from 1931 . Much larger space and so many more Tootsie Rolls can now be made. The New Tootsie Roll Factory in New Jersey. A 1940's Factory Worker inspects Tootsie Pops as they are being made. Factory workers packaging Tootsie Rolls by hand. Tootsie Rolls and Gene Autry in the 1940's. Frank Sintra and Peggy Lipp in a Tootsie Roll Advertisement. It is said that Frank Sinatra's favorite candy was the Tootsie Roll and he was even buried with them. 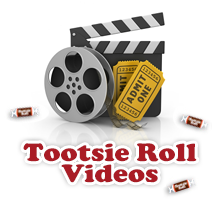 From 1942 - 1945 Tootsie Roll goes to war in G.I. rations, providing "quick energy" for American troops in World War II. The Life of the Party! Life Magazine Advertisement. 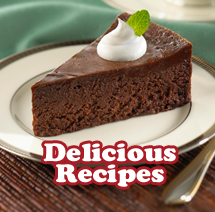 Sweet, Popular and Wholesome. The most popular candy roll for generations. As television sweeps the country, Tootsie Roll sponsors children's shows on national television. Tootsie Roll Sponsors Television Programming as shown in this advertisement from 1954. 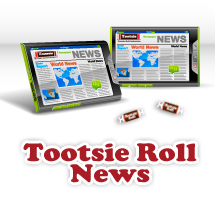 In 1968 Tootsie Roll Industries moved to Chicago where we are still making 64 Million Tootsie Rolls Every Day. Tootsie Roll Pops and DOTS are also manufactured at the Chicago location. Mr Owl is born August 4th, 1970 and takes his first attempt to try and find out just how many licks it takes to get the Tootsie Roll center of a Tootsie Pop! 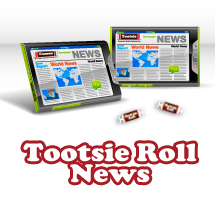 Two famous candy names – Mason Dots and Crows – joined the Tootsie Roll family in 1972. Production of DOTS and Crows has exceeded over 23 million in a day. On 1985 Cellas Chocolate Covered Cherries join the Tootsie Roll family. Charms joins the Tootsie Roll family making Tootsie Roll the largest producer of lollipops in the world. In 1993Tootsie Roll Industries welcomed the addition of Junior Mints, Sugar Daddy, Sugar Babies and Charleston Chew. Happy 100th Birthday to the Tootsie Roll! In 2004, Tootsie Roll Industries acquired Concord Confections adding a variety of Dubble Bubble, Wack-o-Wax, and vending candy products to its family. Tootsie Roll Joined the World of Social Media on August 26th, 2008. With a You Tube Channel, Multiple Brand Pages on Facebook and Twitter, Tootsie Roll has expanded into Pinterest as well as Instagram and continues to expand its reach. Click on the images below to visit our Facebook pages. Meet the Tootsie Pop Squad, team devoted to finding out the age old question... How many licks does it take to get to the Tootsie Roll center of a Tootsie Pop? Will the world ever know? Tune in each week to see what the squad is up to!